YOUR MEETING. YOUR EVENT OBJECTIVES. WE’RE YOUR PARTNER FOR SUCCESS. At GoGather, creating events that promote your brand message, business goals and values is our passion. It’s important to challenge, inspire, motivate and celebrate people. That’s why we begin your event design with the end goals in mind. Our commitment is to deliver exceptional results for your audience and your organization. 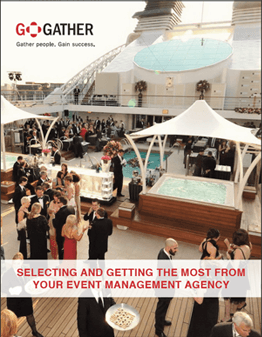 Our Expertise Spans Multiple Event Formats to Optimize Your RESULTS. Need help with your annual company conference and supplier expo? How about strategic and logistical support for your trade shows? Or what about creating a spectacular incentive trip to motivate your sales team? Whatever the objectives or format, our event management experts make your meetings and events rewarding experiences. We excel at events for smaller, specialized groups of around 200 all the way to large conferences and trade shows for 1,000+ participants. We Create Memorable Events at Local and Global Destinations. Whether you need the convenience of a nearby location or want an exciting destination halfway around the world, we’re ready to support you. Our network of hotels, transportation services and other suppliers assures outstanding choices and preferred vendor pricing. We Gather the Best Talent, Ideas and Resources to Exceed Your Expectations. In short, we want to be your trusted partner for success. Relationships matter to us. We’ve found that successful events reflect seamless, behind-the-scene collaborations between internal and external event team members. We take pride in bringing the best talent, ideas and resources to your events. Our Methodology, Built on Innovative Technolo​gies, Brings it All Together. Our GoGather Blueprint strategic meetings management solution takes advantage of the latest Google enterprise-wide technologies. It provides the entire team with a collaborative platform where event goals, plans, budgets, action items and materials are available 24/7. This transparent, real-time access streamlines the entire event management process. It enables everyone to be on the same page and stay up to date. Our online tracking process also makes it easy to quantify the value delivered from your event. I’d recommend GoGather without hesitation. I’ve worked with a lot of event management companies and they’re really fantastic. We made a great team. I had ideas. They [GoGather] had ideas. The key to our relationship was the collaboration. They were willing to be as hands-on and involved as we needed them to be.